I love the samples the Design Team have for us and wanted to join in with this challenge. I'm using up some retired paper from last year called Domestic Goddess, which was rather cute. I liked the colours but some of the sheets weren't really me. I've teamed it with a little cup from the Tea Shoppe stamp set and Feel Goods words from the Seasonal catalogue. Cardstock is Pool Party, Calypso Coral, Basic Gray and Whisper White. Here is a closer look at the cup which is raised on dimentionals on the panel. I've been trying to have a little clean up and go through some of the older papers before our Pre-orders arrive, which I got to order from today, yippee!! Thanks for looking, and have a great weekend. It's Wednesday and that means its time for another challenge at the Paper Craft Crew. This week we have a theme of Father's Day and here is the sketch. I've decided to use Postage Due for my Father's Day card, with some paper from the Print Poetry stack along with the coordinating square and Postage stamp punches and the Square Lattice embossing folder. My Cardstock used is Crumb Cake, Very Vanilla, Midnight Muse and Soft Suede. I've also used Inks in Midnight Muse and Soft Suede. I hope you like my Father's Day card and you're inspired to have a crack at this challenge with a card of your own. Visit the Paper Craft Crew for more inspiration from the talented design team. We hope you will join us this week. Today I've combined stamps on this simple card with Elegant Lines Embossing Folder. I think I will call this card Elegant butterflies. I've used the little Butterflies from the Kindness Matters set with the greeting from Petite Pairs set as well as Two Tags die and Apothecary Accent framelit with some of that delicious Two toned Basic Gray ribbon. My butterflies and greeting were stamped with Lucky Limeade Ink and the centre of the largest was sponged a little. I first stamped them onto Whisper White card and cut out the piece out with the Framelits, then I stamped a second lot on spare card. They were cut out and raised on Dimentionals over a layer of already stamped butterflies. My cardstock is Basic Gray, Whisper White and Pink Pirouette. I hope you like it. Here is a closer look at those Butterflies. Thanks for visiting and don't forget to leave me a comment. Please come back again soon, and have a great day. I found some retired dsp with pink and Plum colours so I'm using a base card of Perfect Plum and the stamp set Artisitic Etchings with the Apothecary accent framelits and Honeycomb Embossing folder for my card. Here is another look at my card. I've also added a tiny butterfly from the Kindness matters set and a retired Square gemstone brad to which I've attatched the greeting from the Tiny Tiny Sentiments set. The cardstock is Perfect Plum, Very Vanilla, Pink Pirouette and Crumb Cake. The ink used is Early Espresso and Crumb Cake. The grossgrain Ribbon used is also a retired roll of Perfect Plum. Thanks so much for stopping by to view my card. Please let me know what you think of this one. I'd love your feedback. Have a great day. I hope those of you that were able to attend Convention over the last few days thoroughly enjoyed yourselves. Today I spent the day and my old High School's 50th Anniversary celebrations and spent a great day getting reaquainted with many friends from old school days. I even participated in Roll calls and had photographs taken with those that went to school in my year. We had perfect weather for it too. I've made an Easel Card with the Top Notes die out of a Crumb Cake base and added a panel to the centre top from Midnight Muse cut with the Apothecary Accent Framelits which I pierced with the matching Paper Piercing template. Here is my card. My daughter has her friend's birthday party to go to, and nothing in my stash would do. She requested me to make her friend Jade a card especially. She likes Butterflies and her favourite colour is Aqua, is all I was told. After suggesting several different options, this is the card I made that she was happy with. I've used some Sale-a-bration dsp on this card with a base of Island indigo teamed with Whisper White and a double layer Butterfly from Pool Party card cut with the Beautiful Butterflies die. 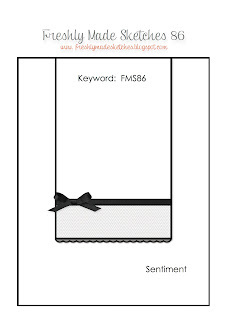 I embossed the Butterflies with the Lacy Brocade Embossing folder and I embossed the White layer of the Window Frame mat with Elegant Lines embossing folder. The age and greeting are from the stamp set Memorable Moments. This style of card is one I've made previously (with Stiched Stockings for Christmas) and it was from an idea I saw on Pinterest by Bronwyn Eastley. I dubbed it a Centre Easel card. Here is a side view. 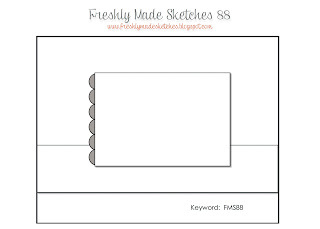 Welcome to this week's Sketch Challenge for The Paper Craft Crew. Here is the Sketch that Pam has provided for us this week. butterflies. I've used Delicate Doilies die on my background underneath my stamped Butterfly Layer. Here is my Design Team card for this weeks challenge. with this card using Need for Speed set, once again, but this time stamped onto a Paint chip. I've also used my Collage Curios set in a bottle cap, which I've flattened slightly through my Big Shot first as I don't like them bulky for cards. The cardstock colours are Basic Black for my base and Whisper White. The background layer of Whisper White was embossed with the Argyle embossing folder after firstly brayering it with Basic Gray Ink. I've used Real Red Ink with the Collage Curios image and greeting. Thanks so much for stopping by. Hope you have a great day. How are you today? We felt the first bit of cold weather coming the last two mornings. It was down to 6 degrees c this morning, pretty chilly for this time of year. However it warms up to a lovely 22 degrees c during the middle of the day. I wanted to quickly get a card made for the Freshly Made Sketches challenge this week. Here is the sketch. I've been trying to use more of my retiring sets and products, so I've decided it would be good to use Artistic Etchings and Tea Shoppe stamp sets for my card today. I've tried to create a Paris Window with a Cuppa on the tablecloth and a view outside. 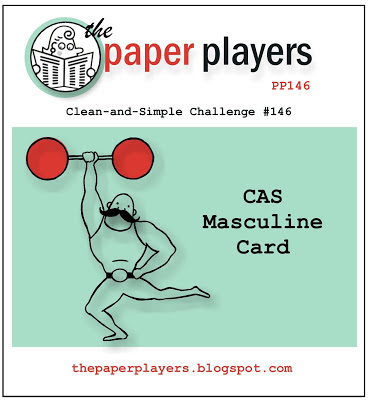 I was excited to find out that this weeks challenge at The Paper Players is to make a CAS Masculine card. We I have a few male birthdays in the family over the next couple of months and I've just made a card for my Brother In Law, which I think fits with the challenge criteria. Here is my card using the Need for Speed stamp set, a little piercing and sponging. The Greeting is from the set Word Play. Cardstock used is Marina Mist and Very Vanilla. Please feel free to leave me a comment and thanks so much for stopping by. Tonights post is a really quick one on a Share PC. Just wanted to show a card I've made today using the Forever Young stamp set. I borrowed the idea for this one layer card after seeing something similar with sponging and a Tree on Pinterest on a card by Heather Tilford. The image was stamped with Early Espresso ink onto a background card of Very Vanilla and an area was masked off with Post it notes and sponged. To finish I've added the Paper Piercing to the bottom edge. Hope you enjoy your day, whatever you're up too. Welcome to this weeks Sketch Challenge with the Paper Craft Crew. Here is my DT card this week. I've made a Sympathy card using French Foliage and Loving Thoughts stamps sets with some retiring colours. My card base is Bravo Burgundy which I've combined with Baja Breeze and Very Vanilla Card. The background Dsp is from a retired pack called Parisian Breeze. This piece is Chocolate chip. I've tied all these colours in with the stamped leaves and greeting. Here is the sketch by Pam that I've based my card from. I hope you will join in and play along too. This is a sketch you can really have some fun with. Simply pop on over to the Paper Craft Crew to see the diversity in the fabulous samples from the Design Team. We hope these will inspire you. The challenge this week at Just Add Ink is to "Just Add Woodgrain". I knew I wanted to do something floral and I immediately think of Nature when I think of something with Woodgrain, so I'm using the Woodgrain Embossing folder on a background with my Elements of Style stamp set. It has been a favourite. It's not originally what I had in mind, however I've used this stamp set recently as it's one which may be on our retiring list (it is in the US) and I know it's stunning with the Faux Mother of Pearl technique, so that's what I've done here. Happy Mother's Day to all the other Mums / Moms out there. I had a nice day today, but my girls and I have been feeling a little under the weather with colds. Had a great day at the Fusion Festival in town, with the girls performing, youngest with the Primary School Band and eldest with the High School Vocal Ensemble. It was hot in the morning, but the weather changed with rain coming and we got soaked leaving the event.